Welcome aboard this luxury yacht of the highest calibre. Sail with the Wind Star to some of the world's most beautiful sailing areas and while enjoying the excellent service, incredible cuisine, and exclusive ambiance on board. On board the Wind Star you have the choice between Outside cabins and an Owner's Suite. 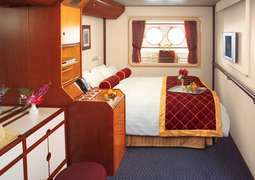 Each stateroom on board is designed for comfort. Both staterooms have luxurious amenities and are spacious with all the amenities you will need while cruising. You are guaranteed to enjoy 5-star luxury no matter which cabin you choose. You can look forward to gourmet cuisine aboard the Wind Star. Three different restaurants are available for your dining pleasure, one of which has outdoor seating for particularly romantic evenings in the fresh sea air. Other fine establishments include a lounge and the Piano Bar, where you can relax with a delicious cocktail, coffee, or soft drink while enjoying the dreamlike view. There is a 24 hour room service available if you feel like relaxing in the comfort of your own cabin in the evening. No matter where you choose to dine, you can be sure to expect culinary delights of the highest quality. The Wind Star has entertainment and activity opportunities for all tastes. You can try your luck with a round of Poker in the casino, spend a lazy afternoon browsing through the countless books in the library, take advantage of all water sports equipment on board or anything in between. In the evening you can relax in the lounge and enjoy a musician or duo performance covering well known music from numerous entertainers. The wellness and fitness offerings aboard the Wind Star are diverse and plentiful. Work out in the fitness studio with a fantastic ocean view, leave your worries far behind with a relaxing massage in the wellness area, or enjoy a day by the pool on the top deck soaking in the sun and splashing in the pool or whirlpool enjoying a spectacular view. Why not try out a new look in the hair salon. Aboard the Wind Star you have the chance to browse through a sport shop as well as a signature souvenir shop, where you could treat yourself to something special or pick up souvenirs for loved ones at home.